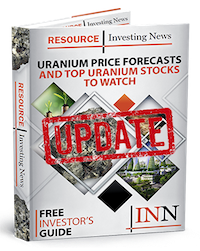 Canadian uranium exploration and development company, UEX, is currently involved in eighteen uranium projects, including seven that are solely owned by the company. UEX Corporation (TSX:UEX), has announced that its 2018 summer drilling program at the Christie Lake project has officially begun. The summer 2018 exploration program is underway, with the goal of expanding the uranium resources on the Yalowega Uranium Trend. The program will focus on testing targets located along strike and southwest of the Ōrora Deposit between the Ōrora and Ken Pen Deposits. Drilling has commenced and is expected to take approximately five weeks. The Ōrora Deposit was discovered during the winter 2017 exploration campaign. Highlights from the 2017 winter discovery program includes hole CB-109, which intersected 22.81 percent U3O8 over 8.6 m from 475.1 to 483.7 m, and hole CB-116A, which returned 20.00 percent U3O8 over 8.5 m from 471.0 to 479.5 m. The Ōrora Zone has a minimum strike length of at least 150 m and mineralization remains open along strike both to the southwest and to the northeast. The summer program will test unconformity targets located northwest and up-dip of basement-hosted uranium mineralization drilled by the previous operator in the 1990s. The target area lies within the 400 m long untested gap between the Ōrora Deposit and the Ken Pen Deposit where the Yalowega Fault intersects the unconformity, the host location of the high-grade uranium at the three known Christie Lake deposits. Since UEX first became involved in the Christie Lake project, I have been eagerly anticipating drilling of the Yalowega Trend immediately northeast and along strike of the Ken Pen deposit. We now recognize that the key structural target hosting high-grade mineralization remains untested over the entire 350 m gap between the Ken Pen Deposit and newly discovered Ōrora deposit. The uranium mineralization at both these deposits remain open for expansion along strike into the gap we are targeting this summer. Within this gap, basement-hosted mineralization has been intersected that has yet to be followed-up to the unconformity. Follow-up similar basement mineralization in 2017 resulted in the discovery of Ōrora,” said Roger Lemaitre, UEX, president and CEO.